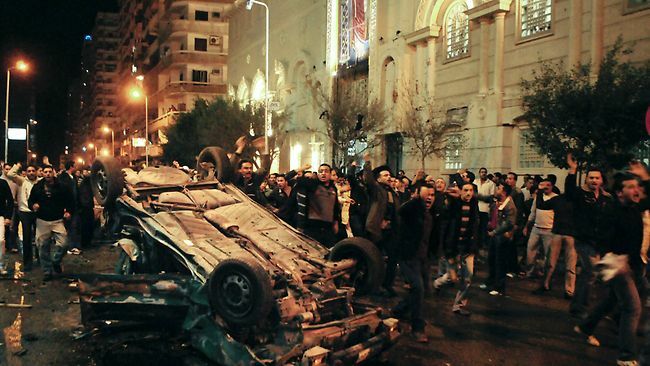 The Alexandria Bombing is a supposed terrorist attack that took place in Alexandria, Egypt on 2011's eve, "killing" 25 Copts Christians at a Christian church. And then, the unlucky victim the media always want. That's right. Her Family name is "Fekry". Her facebook profile [EDIT: I had linked to the wrong one] is still entirely accessible, which is absurd in itself,and it features personal photos mixed with vanilla collected imagery that makes little sense if this was a real facebook profile (why the duplicates? why her personal photos are mixed with Bambi and flowers?). “I will never forget you, I really loved you, you are such an angel,” wrote a Facebook user who identified herself as Sylvia Raafat. “People die because of hatred. Still can't believe it. You will always remain in my heart. 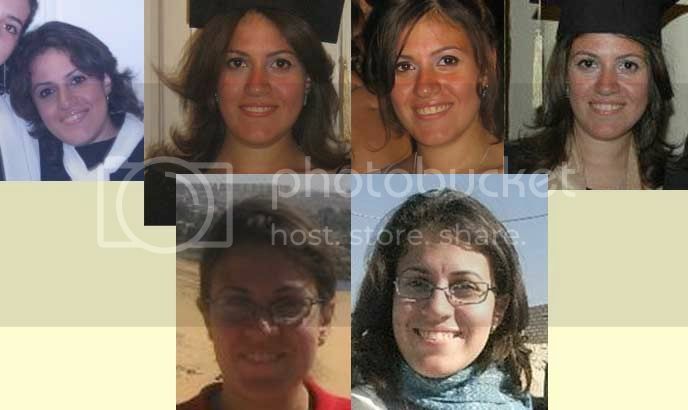 Thank u for being our friend,” wrote another user who identified herself as Dalia Salah El Din. Christians that want blood avenged? Does that sound very christian to you? Or is this thirst for blood part of the fakery scene that is being played on the media? Who are these "hundreds of christian youths" fighting with the police over this attack? Are they real, or rather, like european "Black-Blocs", they are wild actors unleashed to make sure the tone that prevails is not one of reason? I wonder if those 2 similar profile pictures seen on the screenshot you took from her facebook site are just an coincidence? I'm talking bout the 2 pictures showing the halfmoon and the cross. Actually I haven't seen this before and I don't know if it has any meaning, but it kinda looks strange to me. Please check out her friends. I've actually never seen as many crosses or other "not-people-pictures" in someones friendslist as in her. Thats just an example, there are plenty others that use diffent crosses too. regex wrote: Please check out her friends. I've actually never seen as many crosses or other "not-people-pictures" in someones friendslist as in her. Well if the profile is fake, most of the supposed friends have to be fake too. Although the black and crosses profile pictures might be explained with some FB way of mourning. But regardless, it is clear they can be using FB today the way they used the 9/11 memorials pages back in the day. She was with me in Class and in the choir.... we used to stand next to each other in every school concert.... :'-(... she was a very nice and a loving person.... always there when you needed her or felt down... may her soul rest in peace... alla yerhama and we yer7am kol el etwafa.... and may these soulless people who caused that pain suffer for what they have done...!!! We love you Mariam and will never forget you!!!! gonna miss u so much:( u were the best tasoni ever !!! R.I.P MARIOUMA:( ISA IN A BETTER PLACE..
Good digging, thanks for your research! or "Mariouma, Maryam or "Mariam Fikry"? 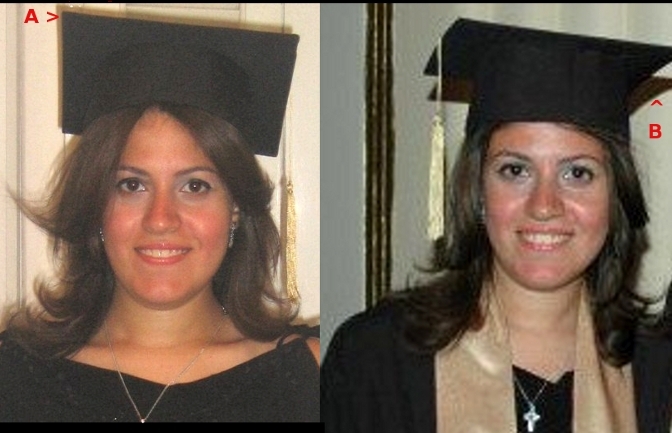 And you may find no less than 6 different "Mariam Fekry" and 8 "Mariam Fikry" on FB - just look it up for yourselves. And just to get another thing out of the way: Yeah, it's the same shite all over again (think "Myriam Hyman and "Honor Elizabeth Wainio"). Just look at the shadows A and B: they show way different lighting conditions - yet the reflections on her face (cheeks, nose, lips) are virtually identical. And are we asked to believe she graduated twice - in her short 22-year lifespan? IMHO, she looks about ten years older in the lefthand picture (in spite of the above-mentioned similarities! Aah, the wonders of photoshopping... )There are other tell-tale signs of manipulation, but I'll let you find them for yourselves. The point is that these are - once again - digitally manipulated images. Full stop. And did Mariam wear those fancy, colored contact lenses? You're free to believe that - I'll just call these FAKE pictures, ok ? "Fekry"? 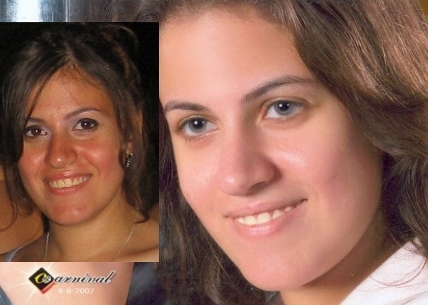 "Mariam Fekry"(phonetical clone of "Fakery")? Oh, how most subtle & refined... I can't help but speculate about a not-so-far-fetched "in-your-face" mockery at our expense by the deplorable beings behind these endless, detestable propaganda stunts. Evidently, these stunts are tailor-made to stir up public hatred against the muslim world. "Servicing whom?" - asks nonhocapito. Hmm, well I do have an idea about that but, true to style, I should just stick to humbly serving to this forum's readers my day's diggings on the subject. Uh, but wait -ehrm..cough..cough...- could Israel somehow have anything to gain from all this? Dang - why can't I keep my mouth shut !? Note that the "Georges" come as either surnames, first names or middle names. And yes, I do find it odd that a choir in Alexandria (Egypt) features such a list of names. Ok, so the "Youssefs" might be a very large family which all participate in the choir. But please check out the rest of the names there - and their sequential/algorithmical nature. If you have read the "VicSim Report", you may get the drift of these observations that I hereby propose. Conclusion: It would appear that the terror-hoaxers are increasingly using the internet to somehow "establish" the reality of the vicsims "killed" in the so-called "Al-Qaeda terror attacks". You may say that this is no news to you - and that all this has already been widely established by the bulk of our research. Nonetheless, it is interesting to note that these methods are still being applied and deemed efficient/manageable by the hapless terror-hoaxers. They are evidently running out of steam, ingenuity and inspiration - which is very good news indeed ! Eventhough many things seems to be pretty weird in my opinion, I can't imagine anyone would want to prepare a facebook account for pretty many years just to make somebody look real. Why would anyone do this? There are easie ways to fake an idendity. So my conclusion is that she is real, simon has some good points though. It's all digital data, wouldn't it be possible for perps to fudge dates on Facebook? I'm a bit of a luddite when it come to these things, so I don't know, just an idea. Speaking of which, how do I post a picture? Well I looked some through the posts she made et cetera, it just looks like a normal fb account. Even if it was digital data you'd need to prepare thousands of status messages, comments, "likes" and so on. Furthermore manipulating the dates on facebook ain't just everydays business. So no, I don't think it's possible without facebook included in this presumed hoax. Am i worth 2 live?? does the world really need me??????????? hey süße! miss u 2. i'm fine. wanna see u soon? I'm not sure, but why would they use these words? Did she study german? This would explain some things cause she also posted many german quotes. simonshack wrote: "Mariouma, Maryam or "Mariam Fikry"? there always seem to be some recurring uncertainness about the spelling of names, which I imagine is supposed to cover the fake of a story with some errors as "noise" from reality. But it doesn't work because it is too absurd. Rest In peace "Mariam Fikry"
where, at the bottom, is written: "Leave A Message For The Martyr Mariam Fekry"
But... what about the other 21? Why are they not listed here? Are those relatives not on facebook? nonhocapito wrote: regex, everything you read online can be faked so don't waste your time asking yourself if it is even possible. It is, all it takes is access. I'm not asking myself. As an IT expert I can tell you that it is impossible to access the database of a service just as safe as the one of facebook is. In the specific case of this victim I can tell you that there is no software to simulate the content of a - more or less- blog that contains data of 3 years. You can proof me wrong if you wish to, but I'm working with AI for about 3 years and you can be sure that the human language is one of the hardest to simulate. You can simulate any other language that is made for databases, scripting, informatics et cetera, but looking at nowadays computer capacity, you won't be able to create such a large content. You could employ someone to make up such an facebook account, but what for? 3 years? Just for this moment? Noone would do that. Hey, an IT expert telling us what's impossible and what nobody would do. I always thought it was possible to manipulate data on a computer. Who knew? Facebook can't even change the ones and zeros on their own systems... amazing! Let me formulate it another way. Suppose Facebook, other than working for the billions of dollars, works for a certain group or agency that uses facebook to control and manipulate individuals into forming certain opinions or committing certain crimes or exposing certain information and whatnot. Google, fecebook & co. are very useful to learn what people do, and also to manipulate them. I hope you recognize this and if you do, that you also recognize that every single military-secret-masonic agency in the world would love to have that power. So these people get access, but not in the sense that they are hackers: maybe in the sense that from their tiny little office, with a click of their mouse, they are enabled to create and destroy and read accounts on the pretense of some security service they are providing to some country or institution. Would you admit, in this case, that they could just plug in ready-made accounts and network of accounts? fred wrote: Hey, an IT expert telling us what's impossible and what nobody would do. Seems like you have absolutely know clue of what you're talking about. Facebook can of course change the whole dataset of an fb account, but at large software companies you hardly work on your own. It's almost impossible to change something to the bad without being caught/detected since many trackers are used. Well, but let's suppose someone really has access to the facebook accounts and could change them however he wants to. Then immediately the question comes to my mind, how they prepared a whole idendity for about 3 years. It's not as easy as with the 9/11 victims cause there exists only one picture and one family member who always tells you the same story. But even if he tells you everything about the victim, you still don't really know what kind of person it was. Thats the difference here: Mariouma has a personality, a documented one. So, there is no technology to generate this personality. There has to be a script or a person that faked the account for 3 years. But you'd also have to mnipulate the friendslist and all the fakefriends. And this is a hell of a work. How does one account for the numerous channel's on YouTube where the supposed person joined in 2007, has no videos posted, has made no comments, has no history, no friends, no subscribers, 1 channel hit [mine? ], then suddenly appear in 2010 to post derogatroy comments on say one of Simon's videos? I've seen this many times too!